← Looking forward to fall here in Mineral Point. When the merchant Joseph Gundry built his big home on an eleven-acre hilltop in the heart of Mineral Point, guests in horse-drawn carriages were welcomed on the broad front porch of the mansion. 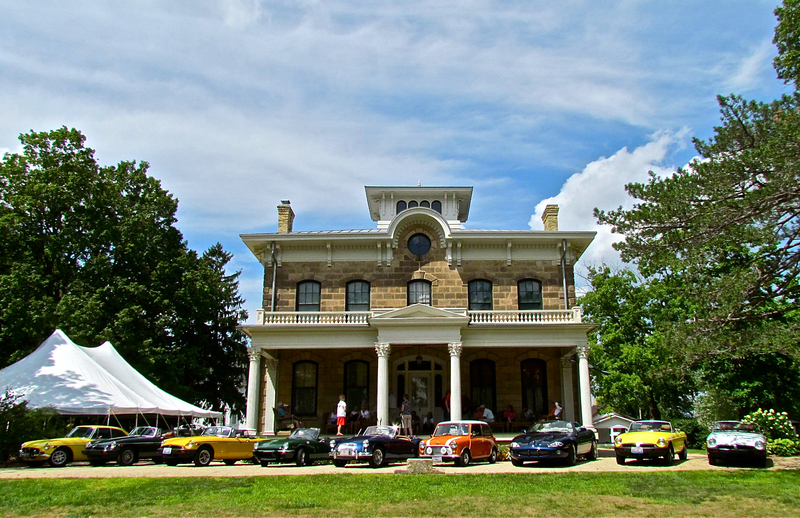 In the hot summer of 2012, the driveway at Orchard Lawn, now the home of the Mineral Point Historical Society, said “welcome” to drivers of the sporting vehicles of the Rockford Car Club. The guests spent a pleasant Sunday afternoon in the shade of the porch, and a local guide gave them a walk-about tour, providing a glimpse of nineteenth century life at one of the city’s major landmarks. Gallery | This entry was posted in Architecture, Entertainment and tagged Frank Beaman, Gundry House, Joseph Gundry, Mineral Point, Orchard Lawn, Wisconsin. Bookmark the permalink.